So what's the deal with that title? It's an odd one, ain't it? It popped into my head when I was contemplating this redesign, that's all. 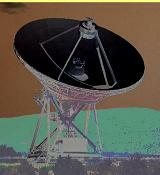 It is relevant I guess, I am a radio telescope operator and I'll hit the big 4-0 this year (meaning 2006). How much of a portrait you'll get from these pages I can't say, unless you want an actual portrait in which case you can find a somewhat recent picture in the About Me section. Are you the guy they call Kansas Jim? I do go by that name in most of my online endeavours. If you are here looking for Torg material you need to visit my other website. If you want an explanation for why I use that name, check About Me. Everything! Well, content wise almost nothing, but every page has been redesigned with the new look. The storm has a name...elsewhere. My telescopes don't usually look like this.